Can Georgia’s new music tax incentives mirror the success of the state’s film tax credits? In order to reach Collective Soul frontman Ed Roland’s Metro Atlanta home studio, you have to step past Duane Allman’s blue denim boots just inside the front door, walk by the baby grand piano – a gift from friend Sir Elton John – in the front parlor, head down the basement stairs, cross the “Ed’s Man Cave” welcome mat and pass the autographed pair of Muhammad Ali’s red Everlast boxing gloves housed in a glass case and many of Roland’s 185 favorite guitars artfully hung on the walls. On this particular winter evening in 2016, the surprises don’t end there. In the recording studio where many of the Stockbridge-birthed band’s albums have been recorded (including its latest, 2015’s See What You Started By Continuing), the members of Collective Soul are jamming with Bert Reeves, the lead singer and guitarist for the Marietta band Attractive Nuisance. In his day job as State House District 34 representative, Reeves turned out to be a secret weapon in the eventual passage of House Bill 155, the Georgia Music Investment Act signed into law on May 8 by Gov. Nathan Deal. Beginning next year, HB 155 provides a refundable 15 percent tax incentive for music that is recorded or scored in Georgia and for music tours that rehearse and start here. To qualify, a production company must meet a minimum threshold of $500,000 annually, $250,000 for scoring projects and $100,000 annually for recording studio projects. If you’re producing music in a less populated section of the state (including cities such as Athens, Augusta, Macon or Savannah), the tax incentive rises to 20 percent. Reeves, a longtime Collective Soul fan, first met Roland when he came to the State Capitol to lobby for the music bill. When Roland found out Reeves played guitar, they exchanged cell numbers and Roland extended an invitation for Reeves to drop by the house where the band was recording a new album. The state’s film tax credits bill passed in 2008 offers a 30 percent tax credit for film and television production, which has resulted in more than 79,000 new jobs over the last nine years and an estimated $9.5 billion in economic impact for fiscal 2017 alone. In comparison, according to a 2011 study released by Georgia Music Partners, the estimated economic impact of the music industry in Georgia was $3.7 billion annually. Caplinger and other music industry experts across the state see the new legislation as a way of honoring Georgia’s unique place in music history as the home of The Allman Brothers Band, The B-52s, R.E.M., The Black Crowes, Otis Redding, James Brown, Johnny Mercer, Usher, Ludacris, Indigo Girls, TLC, Sugarland, Alan Jackson, Zac Brown Band and others while helping to position Georgia to produce the next generation of acts. An especially alluring factoid to the crafters of HB 155: approximately 5 percent of each feature film budget is typically set aside for music scoring, work that has been routinely scuttled to more budget-friendly cities like Seattle or Vancouver. That’s where the bill’s co-sponsor Reeves, a guy who started playing piano in the second grade and grew up to be a classically trained musician, came in. Particularly eye opening for Carter and other legislators was a February field trip to Philips Arena in downtown Atlanta, where hundreds of people were setting up for that evening’s Bon Jovi concert. One of HB 155’s biggest supporters is two-time Grammy-nominated drummer Steve Moretti, a member of The Recording Academy’s board of governors. Moretti, co-founder of the Macon Pops orchestra event series, has worked with everyone from Rosemary Clooney to Michael McDonald, Kenny Loggins, Dee Dee Bridgewater and The Temptations and now considers Macon home. His wife, Amy Schwartz Moretti, is the director of the Robert McDuffie Center for Strings at Mercer University’s Townsend School of Music. With the 20 percent tax incentive now in place for smaller cities like Macon, Moretti is hoping groups like Macon Pops become the go-to musicians for film scoring. But for every optimist like Moretti, there’s a guy like Paul Hornsby wondering how the new tax breaks trickle down to him. In the 1970s, as a staff producer for Capricorn Records, Hornsby helped twist the knobs on iconic recordings by The Allman Brothers Band, The Marshall Tucker Band, Wet Willie and even country queen Kitty Wells. In 1975, he turned indie, opening his own Muscadine Recording Studios in Macon. But with Mercer Music at Capricorn, the ambitious new mixed-use retail and residential development in downtown Macon that will incorporate the historic preservation of the old Capricorn Records recording studio and offices, Macon’s music scene is looking at a $19-million revitalization on its horizon. Over in Athens, where Happy Happy Birthday To Me (HHBTM) record label owner and Athens Popfest music festival director Michael Turner operates his businesses out of a concert poster décored spare bedroom in his house, Turner is also wondering how HB 155 will benefit him and the indie artists signed to his label. The most popular acts on his HHBTM label (including Fred Schneider & The Superions, Eureka California and Tunabunny) generate record sales in the hundreds or thousands, not millions. Meanwhile, his Athens Popfest is chiefly dedicated to spotlighting local independent artists at non-arena venues, including The Georgia Theatre and the 40 Watt. While Athens Popfest routinely attracts visitors from around the world, the tax incentives don’t extend to low-fi festivals like Turner’s. In recent years, Athens has seen the departure of influential local acts like The Whigs, Drive-By Truckers and Future Birds as they sought more lucrative and financially sustainable cities in which to work. Even the Athens-based duo Eureka California, signed to Turner’s HHBTM Records, recorded its 2016 LP Versus in Leeds, England, at the conclusion of a U.K. tour. For the moment, retaining emerging Athens acts like Honeywheel, the first band signed to the new University of Georgia student-run Rock Lobster Records, is easy. 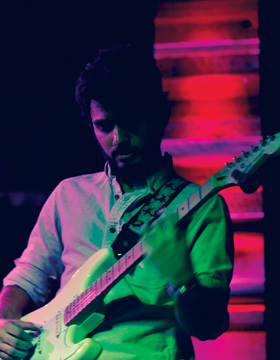 For starters, lead singer and guitarist Shubham Kadam and his bandmates are still students at UGA. Kadam expressed optimism about the new legislation. “The tax incentives for those large acts could help draw attention to us and help foster a larger and more diverse music scene in Athens and Georgia,” he says. Legislators may also consider helping to defray the single biggest expense for up-and-coming bands like Honeywheel – recording studio costs. “With recording or touring grants for exceptional emerging artists, the state would be better able to retain emerging acts,” he says. For Vanessa Briscoe Hay, lead singer of the Athens act Pylon and the unofficial godmother of the Athens music scene, keeping Georgia artists in state remains her top priority. Roland also hopes the legislation can be, as he puts it, refined.